In 1981 a group of seven female musicians formed a band called African Woman - the world's first widely-known all female reggae band. They were Shelomi Coke, Diane White, Caroline Williams, Paulette Coke, Valerie Skeete, Barbara Grossett and Vyris Edghill. 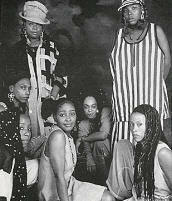 Their debut album 'African Woman Abroad' was released in 1982. Two more tracks, recorded in Germany, were also released on a compilation album called 'People Unite' on a label of the same name. In 1985 Valerie Skeete and Vyris Edghill took another avenue and recorded a soul track, "Watch Yourself" under the name of Akabu. It was an Adrian Sherwood production and was released via the American-based Tommy Boy label. Subsequently it was decided to merge the two ventures, incorporating both reggae and soul under the name Akabu. In 1988 the self-titled album 'Akabu' was released on their own Viva Records label. They went from strength to strength, travelling extensively and making an impact on the live circuit, not only as a band in their own right, but also backing for the likes of Shara Nelson. They have shared the stage with Ziggy Marley, Freddie McGregor, Lee "Scratch" Perry, Aswad, Culture and Maxi Priest, to name but a few. During the late 80s and early 90s lead vocalists Valerie and Vyris frequently provided backing vocals to On-U Sound releases and acts of the period, especially Bim Sherman, Dub Syndicate and Gary Clail. The long and successful collaboration with On-U culminated in Akabu's 1995 'Warrior Queen' album (ON-U LP71), co-produced with Adrian Sherwood, turning out to be the last studio album of the original line-up, though many live shows followed. Vyris Edghill passed away in July 2002, bringing to an end On-U's most distinctive vocal partnership.